A PGA Tour card is the ultimate prize at Q School. If you have serious game and you want to play on the PGA Tour or Nationwide Tour, you must play in the PGA Tour Qualifying School, which is commonly known as Q School. A rigorous test of golf skills in tournament conditions, Q School identifies players who have the physical and mental abilities to compete at the highest levels of professional golf. You'll be competing against other aspiring professionals and, if you advance, the field will be increasingly populated by veteran Tour professionals who've lost play privileges and must attend and succeed at Q School to reclaim those rights. Make sure your game is refined enough to complete at a high level. If you're only occasionally breaking par, your chances of making it as a finalist in Q School are remote at best. Practice incessantly leading up to Q School qualifying and make sure you're in peak physical condition. Each of the qualifying stages are multiple day tournaments, which are supreme tests of physical and mental endurance under intense pressure. Each stage offers play against better players. For instance, PGA Tour players who rank from 126 to 150 on the money list are exempted to the final round, as are Nationwide players who finish from 26th to 40th on the Nationwide Tour money list. Determine if you have the monetary resources and whether you want to make the financial commitment to compete in Q School. The pre-qualifying stage costs $2,700, the first qualifying stage costs $4,500, the second qualifying stage is $4,000 and final qualifying stage is $3,500. Pre-qualifying is a 54-hole event at various sites around the nation. First and second round qualifying stages are 72 holes, and the final qualifying stage is 108 holes. Prize money is distributed at the final qualifying stage: First place is worth $50,000; second place, $40,000; third place, $35,000; fourth place, $30,000; fifth place, $27,500; and sixth place through 25th and ties pay $25,000 apiece. Sign up with the PGA Tour. 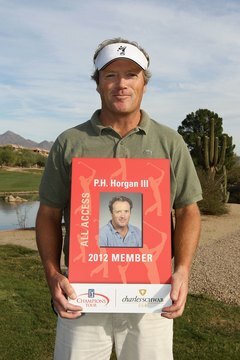 Information about Q School is available at PGATour.com. Typically, announcements are made in late spring or summer about sign-up dates. Pre-qualifying is held in late August and early September. The first qualifying stage is held in mid to late October, the second stage is held in mid November and the finals are in early December. Research the various sites and select one that's appealing to you. Criteria includes proximity of the courses to your residence, past playing experience on the courses, if any, and potential for a top performance at the course. Rigorous, multi-hour practice sessions and practice rounds are an absolute must to achieve optimum performance at a Q School tournament. Living in Orlando, Fla., Edward Schmidt has been an independent travel and golf writer for more than 20 years. His articles and columns have appeared in publications such as "Golf," "Travel & Leisure Golf," "Golfweek," "Golf For Women Magazine," "Links Magazine" and "The Robb Report." Schmidt is a graduate of Tulsa University. What Influence Does Lorena Ochoa Give to Students?